The Ducks opened the scoring in the bottom of the 1st inning on an Angelo Songco RBI single. The 1-0 lead held until the top of the sixth inning, when Olmo Rosario (3) lifted a solo home run to even the ballgame. Somerset took the lead in the top of the seventh inning on a two-out, two-run RBI single from Justin Pacchioli. Long Island later plated three runs in the bottom of the ninth inning on two-out RBI singles from Alex Burg, Delta Cleary Jr. and Giovanny Alfonzo. 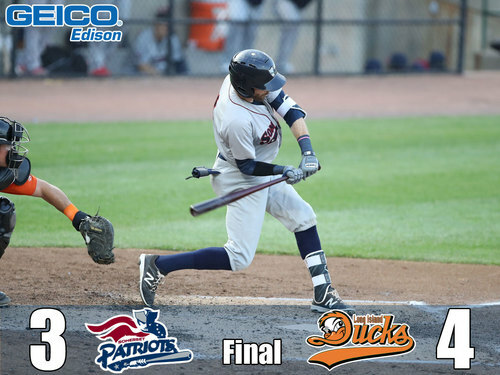 “It’s tough, we played a good game, bullpen did a good job, we had good swings on the ball and they made good plays,” said Somerset Patriots manager Brett Jodie. Neither starting pitcher factored into the decision. Chin-Hua Tsao (1-1) earned the win after a scoreless inning of relief. Jon Hunton (0-1) took the loss, yielding three runs on four hits and two walks in two-thirds of an inning. Somerset continues its series against Long Island Saturday night. Left-handed pitcher Rick Teasley (2-0, 1.68 ERA) takes the mound for the Patriots against Ducks righty Dennis O’Grady (1-1, 2.86 ERA). First pitch at Bethpage Ballpark is scheduled for 6:35 p.m.